Paris, with all its creative hotspots, exhibitions and training opportunities, exerted a magical attraction throughout the nineteenth century on artists from all corners of the world. New generations left their native countries to go to where the action was. 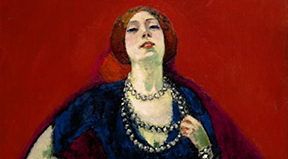 The exhibition The Dutch in Paris 1789-1914 will present Paris with the work of Dutch artists like George Hendrik Breitner, Kees van Dongen, Piet Mondrian, and, of course, Vincent van Gogh. Not only did French artists influence their work, the Dutch made their mark on contemporary artists in France too. For the first time these works are shown in conjunction with each other. The Dutch in Paris can be read as a passionate love story between the Netherlands and France: painters take the viewer on a journey to the ever-changing French capital and show us the city with their eyes and hearts. The chosen works explore Paris and its development through images of Haussmann’s famous boulevards, nightspots like the Folies Bergères and districts such as Montmartre.